"Five of Clubs are great conversationalists as they have accumulated lots of information through their interesting journeys and they are genuinely curious about others. This can make them super fun to be around and great to show-off at dinner parties! Hidden within this inquisitive nature is a deeply sensitive heart. Understand that betrayals of trust are common, because it is their path to forgive and release attachments. The wounding of their sensitive natures can cause some Five of Clubs to develop a friendly, superficial exterior which is meant to protect them. If the wounding is deep, they can even develop an offensive strategy whereby their charm and magnetism is used to manipulate and mislead: engaging one minute; wary and suspicious the next. 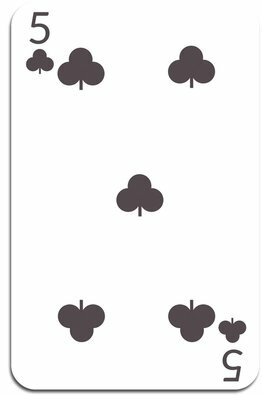 The Five of Clubs is also called the 'change of mind' card. Decisions are hard to come to and once made, the Five of Clubs question themselves. Some find that navigating with a 'go with the flow' or 'play it by ear' attitude works better for them. When they learn to trust this flow, they can be like a child or explorer throughout the rest of their life. At some point in their lives, the Five of Clubs will face their greatest challenge..."
*​​BTW: Scorpios have two (because it has two rulers) and Leos (Sun-ruled) gleen insight from the Royal Archetypes (included below).